I am motivated by the pure enjoyment of the creative process—dying fabric into many colors, cutting the fabric up into shapes and juxtaposing those shapes to form interesting lines and texture. During this process I work to keep in mind the colors' and shapes' relationships to each other and the whole. Many times I draw inspiration from patterning found in nature. As each piece evolves, I derive great satisfaction in seeing what each quilt becomes. Nancy has just been juried into Quilt National for the second time. 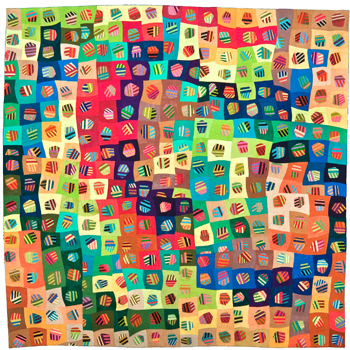 She has also been juried in Quilt Visions three times. Nancy has been invited to show in Color Improvisations and Circular Abstractions: Bull's Eye Quilts, both exhibitions curated by Nancy Crow. She was an award winner at the APNQ Quiltfest, and her work also appeared in the Art Quilt Calendar.